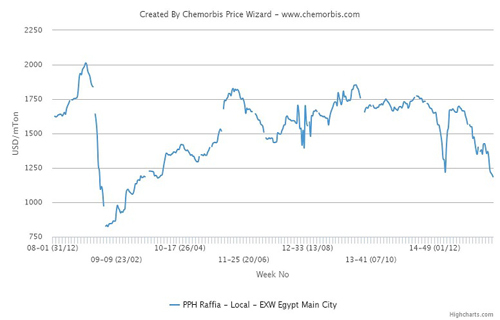 According to ChemOrbis Price Wizard, Egypt’s PP raffia market hit its lowest levels seen since 2009 both for import and local prices. This past week, distributors’ overall raffia prices saw additional decreases of EGP100-500/ton ($13-64/ton). Within the range, Egyptian cargoes tracked a stable to EGP150/ton ($19/ton) softer trend while locally held Middle Eastern cargoes were stable to EGP500/ton ($64/ton) down. In the import market, Middle Eastern producers approached Egypt with up to three digit decreases on their December prices but within the month, offer levels saw additional decreases and prices above the $1000/ton threshold were not found workable. 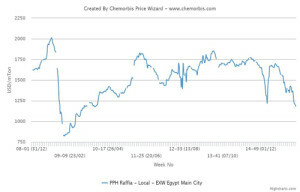 As reported on www.ChemOrbis.com, demand was almost muted as most converters, not feeling content with their end product demand, elected to enter 2016 with no stocks while they were mostly busy with financial book closures as the year drew near to its end. However, sellers were eager to de-stock before the year end and due to their cash flow needs.